How to get here, and where to park on your visit to the UofL Physicans Outpatient Center and the UofL Department of Medicine. The majority of our subspecialty practices are located in the UofL Physicians Outpatient Center located at 401 East Chestnut Street. Our Oncology/Hematology and Bone Marrow Divisions are located in the nearby UofL James Graham Brown Cancer Center at 529 South Jackson Street. Patients accessing either of these facilities are encouraged to park in the UofL Outpatient Parking facility located across the street at the corner of Chestnut and Preston streets. 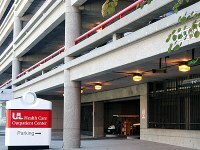 The parking facility has a covered pedestrian pedway on the third floor which directly enters the Outpatient Center, which has a pedway to the adjacent Ambulatory Care Building which also provides an indoor link to UofL Hospital at 530 South Jackson Street. There is also metered parking along most of the streets within the downtown medical community. The University of Louisville Department of Medicine is part of University of Louisville Physicians, the largest, multi-specialty physician practice in Louisville with more than 78 sub-specialties, 1,200 dedicated staff professionals and more than 600 primary care and specialty physicians. For more information, call 502-588-4600.